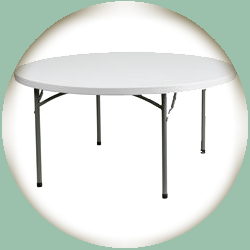 60″ round plastic folding tables provide room for 8 chairs per table. Not using chairs? That’s okay, use them for food only, seminar events, whatever you need. Rated to hold up to 300 lbs. these tables can take whatever you have.